Just finished preparing a presentation for tomorrow's Western States SHPO (State Historic Preservation Conference) meeting, which is being held at the City of Vancouver's Artillery Barracks, part of the Vancouver National Historic Reserve (the affiliated area adjacent to the National Park Service's Fort Vancouver National Historic Site). The lunchtime talk is will focus on our Public Archaeology field school and introduce the SHPOs and their staffs to our experiment with mobile recording technology. A few weeks ago I tweaked our Level Record Form and marveled at its potential to reduce mathematical errors associated with elevations, make routine the use of standardized categories, and streamline data collection in the field. I had hoped to use this with a little project associated with a single 1x1-m test unit, but the timing didn't quite work out. A screen-shot of the first page of our form is shown -- I'll post the entire form once I have troubleshot it a bit more. We had a large number of field school applications this year and it looks like it will be a big group. Am still working out the public lecture series (although almost have it nailed down) and working through the many processes that we run through every year to coordinate between three big organizations -- two Universities and the National Park Service. So many details . 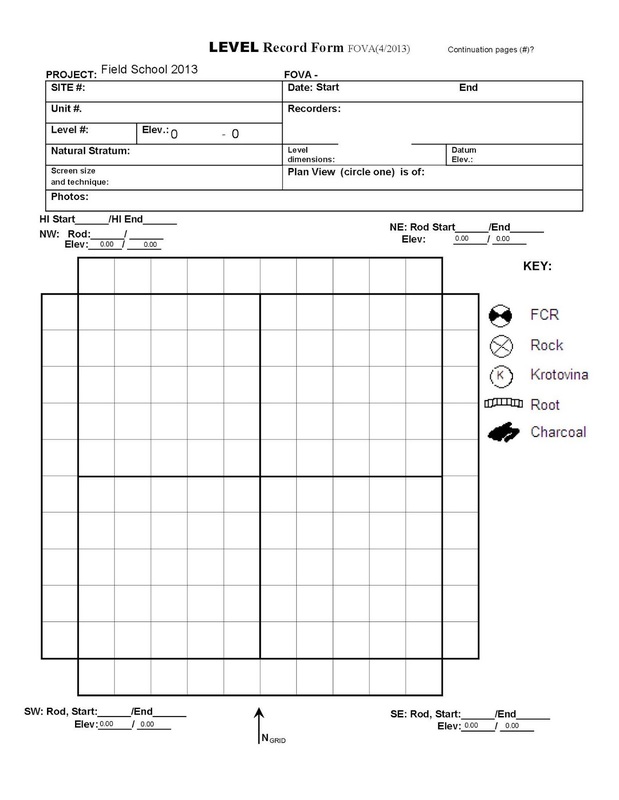 . .
Screen shot of the first page of the Level Record Form.